Releases of toxic chemicals in the US decreased by 12% in 2012, according to the US Environmental Protection Agency's (EPA) most recent Toxic Releases Inventory (TRI) report. 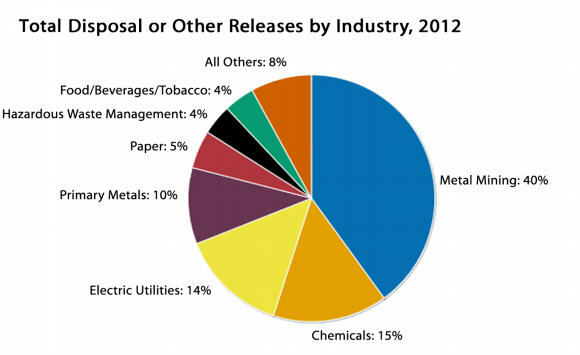 The metals mining sector accounts for 40% of the releases of TRI chemicals. Here's why. TRI is an annual report compiled by the EPA in order to make people aware of what toxic chemicals are being used and released by industries. It's based on self-reported data from 2012 submitted by thousands of US facilities covering over 650 chemical substances. The recorded decrease in the disposal of toxic chemicals is mainly due to a reduction in on-site land disposal by the mining industry, the EPA wrote. The metals mining industry accounts for 40% of total disposal or other release of TRI chemicals. 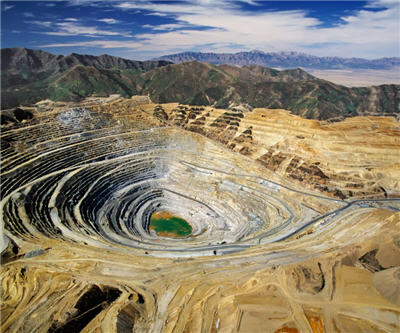 "Most of the metal mining releases are to on-site land disposal; this sector reported nearly two-thirds (65%) of the on-site land disposal for all industries," the report reads. After a steady drop in releases between 2003 and 2009, levels suddenly increased; metal mines were responsible for 97% of the increase in total releases between 2009 and 2011. Latest figures show that this trend is reversing and releases are close to 2009 levels. This is not because production increased – which it didn't. In the mining sector "even a small change in the chemical composition of the deposit being mined can lead to big changes in the amount of toxic chemicals reported nationally," the agency wrote. "In recent years mines have cited changes in production and changes in the composition of waste rock as the primary reasons for the reported variability in land disposal of TRI chemicals." The TRI report also collects information on the quantities of toxic chemicals managed through recycling, energy recovery, and treatment, giving a more complete pictures of what happens to chemicals. In 2012, total production-related waste managed by TRI facilities declined by 14%. But only 15% of facilities reported practices that reduced the total quantity of chemical waste generated. In the metal mining sector, 6 out of 88 reporting facilities initiated practices to reduce their toxic chemical use in 2012. "Toxic chemical quantities reported by this sector are not especially amenable to source reduction, since they primarily reflect the natural composition of the waste rock," the EPA wrote. In terms of which company manages the most production-related waste, Teck American – a subsidiary of Canadian mining giant Teck Resources – takes the number one spot, followed by Koch Industries and the Dow Chemical Company.